Our sesquicentennial celebrations throughout 2016 honoured the foundation of the Congregation of the Sisters of Saint Joseph of the Sacred Heart. 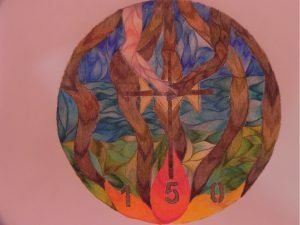 During the year special events enabled all who are part of the heritage of Mary MacKillop and Julian Tenison Woods to renew their commitment to the vision of our Co-founders. to celebrate our unsung heroes who walked before us and planted the seeds of the Gospel. to rejoice with our partners in mission who are listening and responding to the heartbeat of the world today, through various groups responding to the challenges of today – reaching out and sharing our resources with others. to reflect on how we listen and respond to the heartbeat of the world today. to be challenged to the truth that one person can make a difference. to be optimistic and open to the new relationships beyond 2016 with those who will continue the legacy of Mary MacKillop and Julian Tenison Woods. The year was filled with gatherings for Eucharists, prayerful and reflective moments, pilgrimages, celebrations, a Justice Conference, and special launches, to be held across Australia, New Zealand, Ireland, Scotland, Peru, Brazil and East Timor. Carmen and Angel Llanco, Covenant Josephites from Peru with Sr Katrina van Ruth currently ministering in Peru. Carmen and Angel are in Australia representing the Peruvian people for the occasion of our Sesquicentenary. 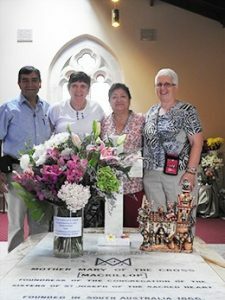 Carmen and Angel presented the Sisters of Saint Joseph with the beautiful Peruvian sculpture of Mary MacKillop surrounded by the Peruvian people. 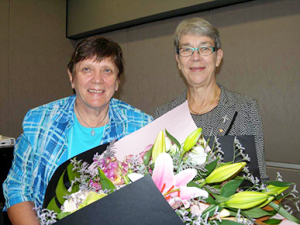 Sr Monica Cavanagh with Sr Judith Lawson the current President of CLRI NSW presenting the Sisters of Saint Joseph with a beautiful bunch of flowers on behalf of all the Religious Congregations at the recent Conference for Leaders to congratulate us on our Sesquicentenary. We brought them home and placed them on the tomb of Mary MacKillop. A woman called Mary began. to every woman and man. Guiding Mary on this path. To show that all people have worth. Beginning a school in Penola. And simple was its cause. Knowledge of religious faith their wish. Sisters of Saint Joseph of the Sacred Heart began. Sr Denis Earl, Sr Mary Cresp, Sr Katrina Brill, Sr Monica Cavanagh.